If you want to take photos of birds, you need these 6 ingredients. Obviously, you need birds. So you will need to go to places where you can find birds. Each bird depends upon a specific type of habitat for its survival. So the key to finding birds is knowing where they live. For example, you will need bright sun to take photos of flying birds. Then you might want overcast days to take photos of perched hummingbirds. Okay, I’ll admit that you can take photos of birds in almost any type of weather (although blizzards, hurricanes, and tornadoes present notable challenges). Even with perfect birds and perfect light, you will have to wait. This happens because birds don’t wear watches. So they often miss appointments. As a result, you wait. Then you wait. And you wait some more. Eventually, you decide to leave that spot so you can wait somewhere else. Certainly, your mental well-being matters, especially after waiting for hours without taking a photo. So you must find something positive in every experience, such as feeling delight that you were able to practice focusing your camera on a branch. After an hour (or two), you may become quite skilled at this. Let’s recognize that a bird’s appearance is a random event that wasn’t supposed to happen. 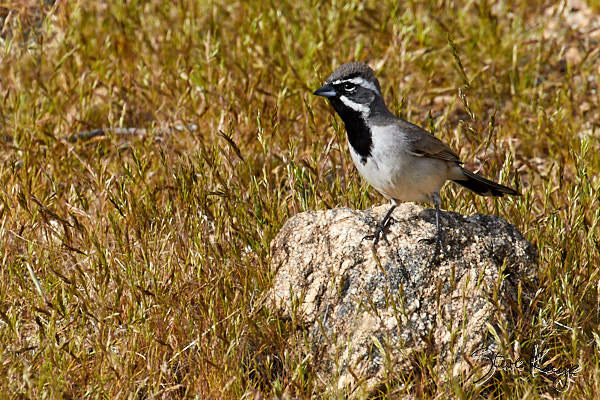 So if a bird, like the Black-throated Sparrow shown above, hops on a rock, that’s luck. Neither you nor the bird woke up planning that. Please find an alternative to plastic Easter Grass. For example, use crumpled tissue paper or a piece of cloth. Sadly, birds use Easter Grass to build nests. And then the bird becomes trapped in its nest. I’ve never seen this bird. Where did you shot this photo? I am constantly amazed and delighted by your photos. So it was good to read your ingredient 5, Optimism, with its reference to mental well-being and delight in an hour of practising focusing on a branch. I don’t know what, if anything, I can do about this for myself, but It’s nice to know what’s involved in making pictures like yours. Thank you for asking. I took the photo in Joshua Tree National Park, CA, in the Black Rock Campground area. And a seventh important ingredient – passion!